Antoni Tàpies i Puig is one of the most important Spanish artist. 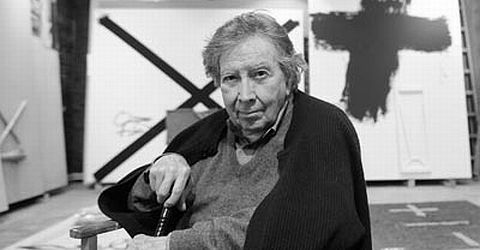 He was born in 1923 in Barcelona, Tàpies died on 7 February 2012. Tàpies appropriate the artistic skills to himself. At the beginning of the 40s of the previous century, he studied law, but he never stopped this study. In its early phase he painted portraits in the style of van Gogh and Picasso. But then he turned to the abstract painting and developed his own style. He wore paint and other materials thick and partially scratched off. By alternating application of paint and scraping out the surfaces gives a look like old walls. Antoni Tàpies was influenced by Miró, Klee and Ernst, in some phases his works are assigned to surrealism. Through a scholarship he came to Paris and had contact with the so-called "informal painting." Here, the artistic means are reduced to the essentials. Tàpies also takes up religious elements in his work. In the 1970s Tàpies takes party against the Franco's dictatorship. In 1984 in Barcelona, he founded his own foundation, the Fundació Antoni Tàpies. 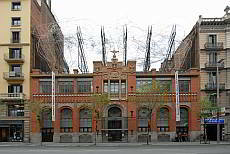 The Fundacia Antoni Tapies houses the works of the most important artist after Miró in Barcelona. You can recognise the building with its crown of wire mesh from far away.